UPA Report 02.19.17 The greatest threat to America is a liberal media bias. 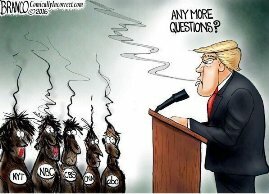 Watch and listen to Trump put the media in their place. Illinois – Anti Sanctuary Rally Saurday Feb. 25th at noon. Come and let your voice be heard! Tell Gov Rauner to VETO HB 426 that will make Illinois a Sanctuary State and cost Illinois Taxpayers $$$ We will he from speakers who will educate you on the Problems in Illinois brought on by illegal immigration!! Take the Offensive: moving from protest to Resistance. Many Obama leftistas imbedded in all gov’t agencies. Military, Judicial Intelligence agencies etc. America‘s spies anonymously took down Michael Flynn. That is deeply worrying. Normally intercepts of U.S. officials and citizens are some of the most tightly held government secrets. This is for good reason. Selectively disclosing details of private conversations monitored by the FBI or NSA gives the permanent state the power to destroy reputations from the cloak of anonymity. This is what police states do. down and useless Republicanism that has caused most of America to detest them. Stop the Islamization of the U.S. Refusing to designate the Muslim Brotherhood a foreign terrorist organization would be a grave mistake, playing straight into the strategy of the Brotherhood and, once more, revealing to the world the extreme gullibility of the West. This is he kind of thinking that is destroying Europe with Muslim invaders. Graham says the wave of Baby Boomers expected to retire over the next few years and begin drawing Social Security and Medicare benefits need to be supported by a large (immigrant) workforce. citizens at the local level to work together to continue Restore our Republic at all levels – Town and City, County, State and Federal.